September 5, 2014 – Three crew members aboard the International Space Station are scheduled to end almost six months on the orbiting laboratory on September 10 and NASA Television will provide complete coverage. Expedition 40 Commander Steve Swanson of NASA and Flight Engineers Alexander Skvortsov and Oleg Artemyev of the Russian Federal Space Agency (Roscosmos) will undock their Soyuz spacecraft from the station at 7:02 p.m. EDT September 10, for a landing in Kazakhstan at 10:25 p.m. (8:25 a.m. September 11, Kazakh time). Their return will end 169 days in space since launching from Kazakhstan March 26 for a mission that covered almost 72 million miles in orbit. At the time of undocking, Expedition 41 formally will begin aboard the station under the command of Max Suraev of Roscosmos. 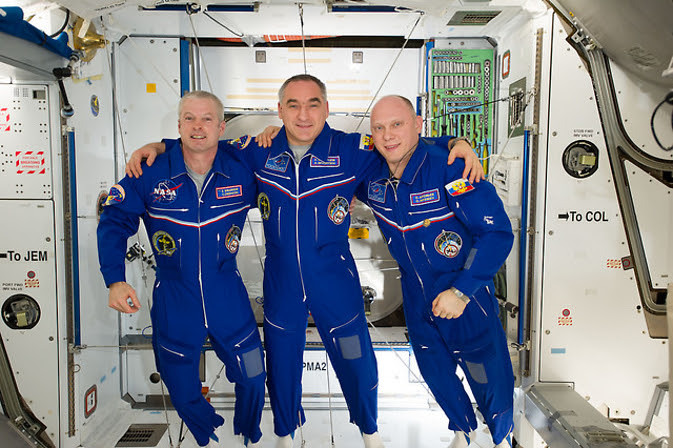 Suraev and his crewmates, Reid Wiseman of NASA and Alexander Gerst of the European Space Agency, will operate the station as a three-person crew for two weeks until the arrival of three new crew members. NASA astronaut Barry Wilmore and Russian cosmonauts Alexander Samokutyaev and Elena Serova are scheduled to launch from Baikonur, Kazakhstan, September 25, (U.S. time), on a six-hour flight to the space station. NASA TV coverage will begin Tuesday, September 9, with a change of command ceremony when Swanson will turn over control of station operations to Suraev, and will continue September 10 and 11 with Expedition 40 landing and post-landing activities.